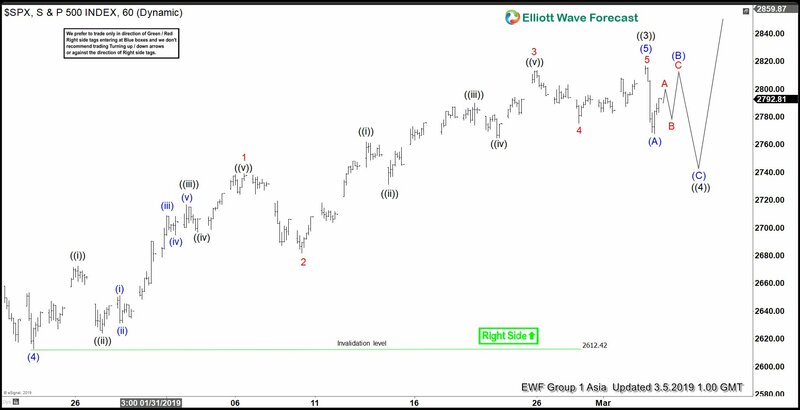 Short Term Elliott Wave view in S&P 500 (SPX) suggests the rally from December 26, 2018 low (2348.50) is unfolding as an impulse. Index has ended wave ((3)) of this impulse move at 2816.88. In the chart below, we can see wave (5) of ((3)) move from 2612.42 low subdivides in 5 waves impulse of a lesser degree. Up from 2612.42 low, wave 1 ended at 2738.98 and pullback to 2681.83 ended wave 2. Index then rallied again and ended wave 3 at 2813.49. Wave 4 pullback ended at 2775.13, and wave 5 of ((3)) ended at 2816.88. Wave ((4)) pullback of the larger degree is currently in progress before Index resumes the rally higher in wave ((5)). The internal of wave ((4)) is unfolding as a zigzag where the first leg down to 2767.66 ended wave (A). While wave (B) bounce stays below wave ((3)) at 2816.88, expect Index to turn lower to continue the zigzag correction within wave ((4)). We believe dips in the Index still can see buyers in 3, 7, or 11 swing for 1 more leg higher in wave ((5)) before cycle from December 20, 2018 low ends. We don’t like selling the Index.